The bishop with the red miter, Saint Nicolas, was honored this week on 196 flavors. In fact, in the Christian calendar, December 6th marks the day of Saint-Nicolas. 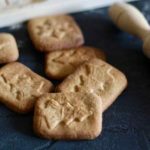 We understood, through our posts about speculoos and gingerbread cookies that Saint Nicolas was somehow the ancestor of Santa Claus, a symbol of goodness who over time, became the patron and protector of all children. Many legends associated with Saint Nicolas exist and reflect his generous personality. Without listing them all, there is one that is probably as common as “the legend of three small children,” legend that Mike mentioned and that made St. Nicolas the protector of children. This legend is “the legend of the three girls “, which made him also the patron of unmarried girls. One day, Nicolas heard talks of an impoverished nobleman, whose three daughters were old enough to get married and did not have enough assets to pay the dowry. Food was scarce and the family sank into poverty. Very sad, their father decided one day that his daughters were going to leave home to be sold as slaves. But the day they left, one of them discovered her sock filled with gold which allowed to feed the family and pay the dowry of the eldest daughter. The next day, another bag of gold was deposited and allowed to pay the dowry of the younger sister. The next night, convinced that a new bag would show up, which was the case, the father decided to discover who filed all these socks with gold coins. He found himself face to face with Saint-Nicolas, who asked him not to reveal anything to anyone. Although he promised to keep it to himself, the father shared the name of the mystery giver and the whole city quickly found out. This man was finally able to marry his daughters. Saint Nicolas thus became the patron of unmarried girls and it is since customary for young girls seeking a husband to implore this Saint. 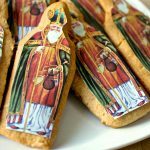 Saint Nicolas is celebrated in many countries, mainly in northern and eastern Europe. After passing through Belgium with their speculoos, and Lorraine with their Saint Nicholas Gingerbread cookies, we’ll take the direction of Alsace for the famous mannalas. Mannala means “little guy” in Alsatian. It is called Mannala in the Haut-Rhin (South of Alsace) and mannele in the Bas-Rhin (North of Alsace). 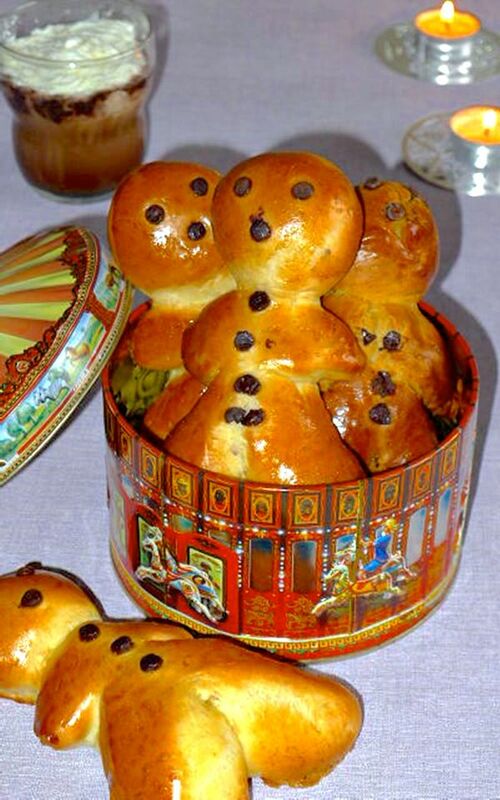 It is a variety of brioches shaped as little men served in Alsace for St. Nicolas since the fifteenth century. They are always served with hot chocolate. They are also baked in Franche-Comté and Lorraine, where they are called Jean Bonhomme. 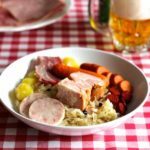 In German-speaking Switzerland, they are called Grittibänz, in Western Germany, Weckmann or Stutenkerl and Boxemännercher in Luxembourg. Mannalas evoke the legend of the three little children returned to life by St. Nicolas. 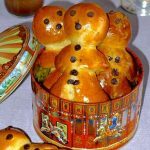 You will also find in Alsatian bakeries larger men-shaped brioches decorated with ornaments and the episcopal crozier who represent Saint Nicolas. Who never had issues at least once with any dough raise their hands! The dough of mannalas is very easy to make and I would say hard to fail, but let’s talk about the shaping of these little guys. – Lightly flour the work surface so that the dough does not stick. – Weigh each part of the dough, whether the head or the body. – Push the chocolate chip so that the eyes do not leave their orbit. – Cut the arm at the same level on both sides. 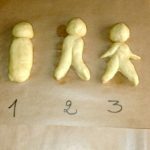 – Avoid making the arms and legs too thin as they could become dry during baking. – Place the head on the body and cut the arms and legs directly on the baking sheet. Don’t panic! You can watch this video to help or buy yourself a cookie cutter! 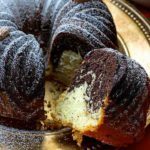 Although I did not create this traditional and authentic recipe, I admit I put my personal touch: baking soda in order to get more airy and soft texture. These milk brioche buns were a treat! We ate them barely warmed, which I highly recommend you do. 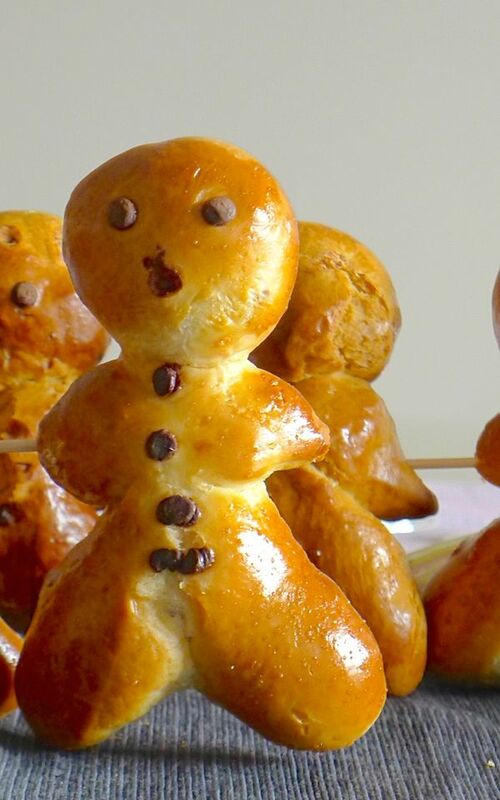 Mannala, a variety of small brioche shaped like little men is a traditional recipe available in Alsace for Saint Nicolas holiday. 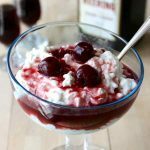 In a large bowl, mix the yeast with ½ cup of milk and sugar. Add the remaining milk and mix. Set aside for 2 minutes. In the bowl of the food processor, combine flour and baking soda. Stir in the diced butter with your fingertips. Make a well in the flour and add the milk, sugar and egg mixture. Knead on low speed until reaching a dough that does not stick. Moderately increase the speed, add the salt and knead for 8 minutes. The dough should not stick to the edges of the container. Add a few tablespoons of flour if necessary. Cover the dough with a damp cloth and let rise in a warm place, free from drafts, for 1h30. Place the dough on a floured surface and work a few minutes. Divide the dough in pieces of about 3 oz. Cut a quarter of each piece of dough into a ball to form the head. Then shape the rest of each piece of dough into a cylinder and place on the baking sheet. Lightly flatten. Using a sharp knife, cut the legs and arms of the mannala. 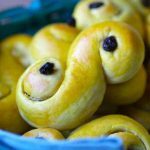 Place the head of the mannala above its shoulders and place 2 chocolate chips for the eyes and one for the mouth. Place no more than 8 mannalas per baking sheet. Cover the mannalas with a slightly damp cloth and let raise in a warm place, free from drafts, again for 30 minutes. Preheat convection oven to 430 F.
Brush mannalas with the egg yolk and milk mixture. Place in the oven and reduce oven temperature to 390 F.
The mannalas should be golden brown. G’day Looks great and always enjoy hearing about the food history! Pinned! They don’t look like the picture, 0/10.